The Sheeran by Lowden line features eight individual models across two small body sizes. 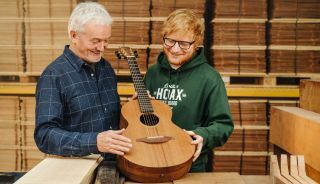 NAMM 2019: In a surprise announcement, Ed Sheeran has teamed up with Northern Irish guitar makers Lowden to launch a new range of guitars, Sheeran by Lowden. The Sheeran by Lowden line will feature eight individual models across two small body sizes from the Lowden range, known as the S and the Wee Lowden, both played by Sheeran himself. The guitars have been designed by George Lowden for the player, with sustainably-sourced wood species including naturally fallen trees and reclaimed Spruce. Sheeran Guitars by Lowden will be available to order through select music merchants. For more info, head on over to sheeranguitars.com.